61. The Burmese Ruby Tiara: At the beginning of her third decade on the throne, the Queen had acquired a few tiaras with colored gemstones, but none set with rubies. (We'll see later why she didn't have one ruby tiara, the Oriental Circlet, in her collection at that point.) She remedied this by ordering a new tiara from Garrard. The rubies that went into the piece's construction had been a wedding gift from the Burmese people in 1947; the diamonds were harvested from another wedding present, the Nizam of Hyderabad Tiara. The new tiara, which is still worn occasionally today, features Tudor roses in its design. 62. The King Khalid Necklace: During an official visit in February 1979, King Khalid of Saudi Arabia presented this classic Harry Winston diamond and platinum necklace to the Queen. It's easy to see why she's worn it often at gala events throughout the years; its design is balanced and beautiful. The Queen also lent the necklace to Diana, Princess of Wales during the 1980s. 63. The Dubai Sapphires: During the same Middle East tour in 1979, the Sheikh of Dubai gave the queen a demi-parure of sapphire jewels, including a necklace, bracelet, and earrings. The necklace is notable for its looped shape. The Queen has worn the pieces occasionally since. 64. The Jardine Star Brooch: Lady Jardine bequeathed this classic, star-shaped diamond brooch to the Queen in 1981. Not much is known about the brooch's provenance, but Leslie Field states that the piece is Victorian. There's a bit of mystery surrounding its origins, but there's no question that it has become a firm favorite of the Queen. She even selected it in 2012 for one of the events of her Diamond Jubilee weekend celebrations. 65. The Sri Lankan Floral Spray Brooch: The Queen traveled to Sri Lanka for a state visit in the autumn of 1981, and during the trip she was presented with this lovely floral brooch. The piece is set with multi-colored precious and semi-precious stones; it also combines faceted stones with cabochons. 66. The Qatari Rubies: The Amir of Qatar added to the Queen's collection of modern ruby jewels in 1985, when he presented her with a new set of jewels during a state visit. The suite includes a diamond and ruby swag necklace and a pair of coordinating earrings. 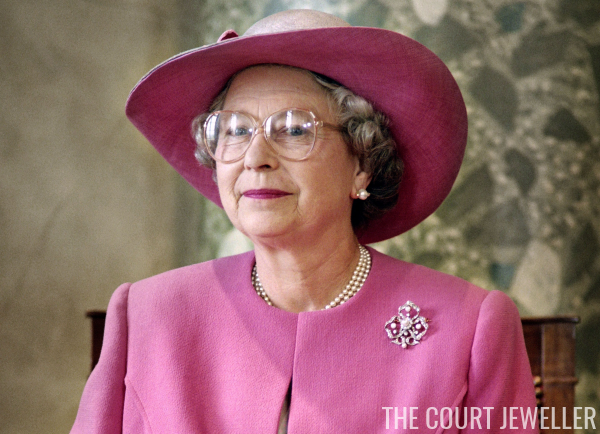 The Queen has often paired the jewels with her Burmese Ruby Tiara. 67. The Pearl Trefoil Brooch: Another favorite brooch with another mysterious provenance -- this diamond and pearl brooch has been in the Queen's collection since the 1980s, but nothing is known about its background. 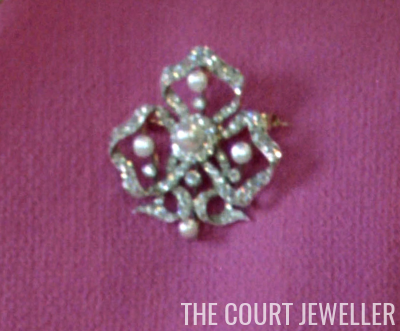 The trefoil shape of the brooch and the five pearls in its setting make it easy to spot among the Queen's roster of daytime brooches. 68. The Emerald Tassel Suite: First worn in 1989 during a state visit from the United Arab Emirates, this modern suite of diamond and emerald jewelry includes a necklace, a bracelet, and coordinating earrings. The necklace and earrings are especially easy to identify, thanks to their elaborate tassel motifs. 69. The Coral Rose Brooch: This Cartier-made brooch was presented to the Queen in 1990 by the French Order of Liberation. It features a pair of coral roses studded with diamonds, and the Queen has generally worn it to events in France (or related to France) since she received it. 70. 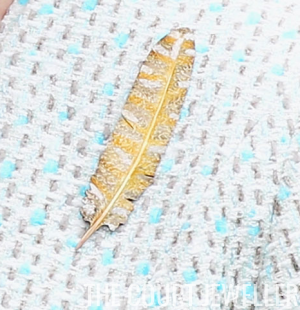 The Braemar Feather Brooch: To mark her Golden Jubilee in 2002, the Braemar Royal Highland Society gave the Queen a feather-shaped brooch made of white and yellow gold, silver, and platinum. The Queen has worn it at the annual Braemar Highland Games every year since receiving it.